The Velo is your top of the lineup hitter, your table setter, equipped with a ton of speed and great..
All new for 2019, the 5150 baseball bat from Rawlings features 5150 Alloy, which is Rawlings' most r.. The new Louisville Slugger Select 719 brings the power to keep your game going. The most endloaded b.. The Project 3 Element is built as a premium option in Easton's 2019 lineup. This sizzling stick is m.. The 2019 DeMarini Voodoo One Balanced adult baseball bat is designed to deliver the competitive edge.. This end loaded Voodoo Insane BBCOR Bat brings the boom with a massive barrel size to drive the.. The 2019 DeMarini CF Zen Insane adult baseball bat is specifically engineered for hitters who step t.. This bat is the ideal option for speedy contact hitters at the top of the lineup, delivering a natur.. The famous Rawlings "Glow Stick" is back and shining brighter than ever for 2018! Contact hitters ca..
Drive in the runs this season with the 2018 edition of Rawling's popular 5150 model. This fully comp.. The dominant F5 from Marucci is a force of nature at the plate, built with a stability optimized 1 p..
Go toe to toe with the premier power pitchers in your league with the one piece phenomenon known as ..
With the highest feedback so far in 2018, the Select 718 is a top contender and very comparable to t..
For a limited time we are selling this bat at retail price with free heat rolling and shipping. .. The Louisville Slugger Omaha 518 is here to help you take over your league this season. Smooth swing.. Put the team on your back in 2018 when you take the Easton Z-Core Lock & Load to the plate with .. The 2018 Easton Ghost X is designed as a pitcher's worst nightmare, equipped with a ballistics grade.. The Easton Beast X Hybrid is all new for 2018 so you can embark on a chase for your league champions.. The Beast is here to make its presence known on the field for the 2018 season, crafted with an advan.. The new Insane offers a stiffer handle and larger sweet spot compared to last years Demarini Voodoo .. Need the free swinging feel of a composite with the sound and feel of an alloy stick? The 2018 DeMar.. The DeMarini CF Insane brings a list of upgrades for the 2018 season, including a stronger composite.. The new 2018 Demarini CF Zen is a perfectly balanced two piece composite BBCOR bat. The 2018 Demarin.. The Rawlings Velo features extreme balance, explosive swing speed, unmatched bat control, and enhanc..
New for 2017! The Rawlings 5150 is one of the most iconic one-piece alloy constructions ever made. T..
Unleash the Marrucci Cat 7 in your BBCOR league to give your team the competitive edge all season. T..
Rake in the extra bases all season long when you choose the 2017 Marrucci Cat 7 Connect as your plat..
New for 2017! The latest and greatest members of the Power Brigade are here and ready to be unleashe..
New for 2017! One of the most popular baseball bats of the 2015-16 season is back and better than ev.. The all NEW Louisville Slugger Omaha 517 features a HUGE sweet spot and a stiffer feel. Constructed ..
Never before seen and new for 2017! The Solo 617 is Louisville Slugger's newest edition to the BBCOR.. 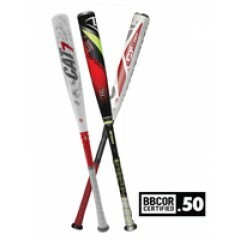 The Easton 2017 Z-Core Speed Whiteout BBCOR Baseball Bat features a Speed barrel design, which .. Amplify your power with EASTON’S® Z-CORE™ HYBRID TORQ®. The new Z-CORE™ HYBRID TORQ® -3 is a balance.. The Z-Core Hybrid -3 is a two-piece aluminum/composite hybrid design that’s slightly end-loaded f.. Amplify your power with Easton’s MAKO® BEAST TORQ®. The new BBCOR MAKO® BEAST TORQ ® -3 combines the.. The BBCOR model of the DeMarini CF Zen bat offers all the signature smooth swinging of the line in a..
We test every bat model to ship into our warehouses here at Club Rollers, and few baseball builds ex..